Choosing a research topic wasn’t tough for this PhD candidate from the Iruka tribe. 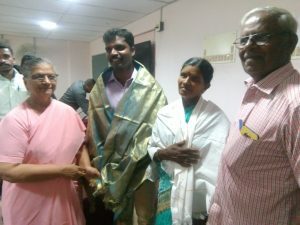 Born in a poor family working in a brick-kiln, Sakthivel got his PhD from Annamalai University for his study of brick-kiln workers of Villupuram district. He hails from Salaiyampalayam village of Koliyanur union in Villupuram district. His parents Thangavel and Kalvikkarasi were working in a brick kiln and had no formal education. 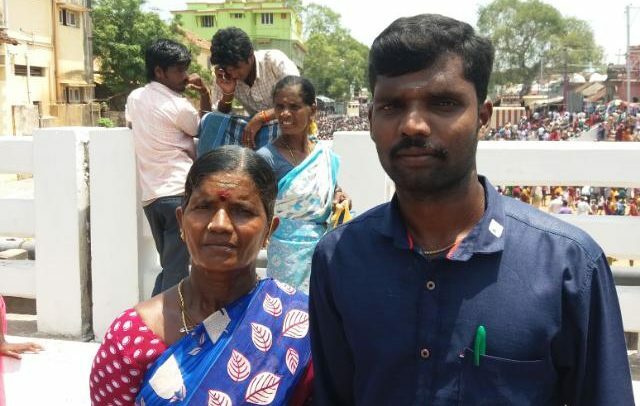 Mother Kalvikkarasi was however particular about providing education to her children, and much of the credit for this inspiration should go to the Pazhangudi Irular Padhukappu Sangam, the Association for the Protection of Irular Tribe. “We live in a small hut without toilet facility. There was no electricity till I studied in 8th and even now, we manage only with a single bulb at home. I studied till my 5th, in a government primary school there and then joined the Government boys higher scondary school in Valavanur for my 6th. I had to walk 5 to 6 km daily for going to school and had to cross a lake en route. This made my elder sister discontinue school after 8th standard. I continued with my schooling, but as I scored only 32 marks in English in 10th std I couldn’t pass the exam. I somehow managed to pursue my studies in Shanthi Nilayam, the free coaching centre for scheduled castes and scheduled tribes in Villupuram and cleared my English paper. In between, I also used to go for brick kiln work with my mother. It was this experience that gave me the determination to study hard and get out of the clutches of poverty. Pazhangudi Irular Padhukappu Sangam people were also impressing upon my mother that she should educate me, come what may. So, my mother admitted me in school again”, says Sakthivel. 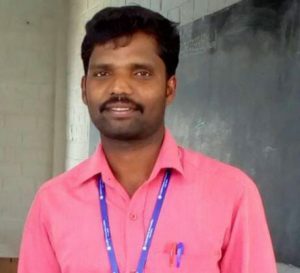 After qualifying in the 10th standard English paper, he pursued the plus 1 course in the Valavanur Government higher Secondary school, taking Economics, History, Geography and Computer Science, as his subjects. He then passed plus 2, securing 821 out of 1200; did BA (Economics) subsequently in Cuddalore Periyar Govt. Arts College in 2007 and came out successful in first class with 65% marks. He did his post-graduation in the same subject of economics atat t Chidambaram Government Arts College and passed the course with 68.23 % marks. Then he joined M Phil course in the same college, and did a study on the employment opportunities available to the workers of the cooperative spinning mill, Thirubuvanai in Puducherry. Later he enrolled himself for PhD under the guidance of professor G Ravi, head of the economics department in Annamalai university, and started with the research on the economic condition of the brick kiln workers of Villupuram district. “These labourers are made to live in poor conditions, are not provided with decent places for staying, and not even extended toilet facilities. These contribute to their ill-health and there is also no insurance cover for them. The labour welfare department is also not taking sufficient care for protecting their interests. The workers are also unable to repay their loans taken as advance payment, and are put to intense hardship” – Sakthivel highlights these points as having come to light through his study, and pleads that the Government should take concrete steps to pull these workers out of the debt-trap. “Getting educated is the only way that people from humble background like me can hope to lead honorable lives. But even this is becoming hard for students from Irular Tribe, as they are finding it very difficult to obtain community certificates in the Scheduled Tribe category. Ever since I was in 8th standard, my mother has been knocking the doors of RDO and Taluk offices repeatedly, for obtaining community certificates for me and my elder sister. It could somehow be obtained at some stage, and I could continue my studies only because of that. But many others are not that lucky, and they end up discontinuing their studies. Community Certificate is essential not only for continuing studies, but also for getting Government scholarships. It is the right of the Irular students to get Community Certificates, and if this all-important certificate is made available to them, they will definitely manage to study and qualify themselves creditably” he asserts confidently. “I have been studying only in Tamil medium from primary school. As there was a provision to take my BA exam in Tamil, there was no problem for me there; but I really struggled to write my MA exam in English. So, I used to practice hard by writing lessons repeatedly, and thus, I could pass my college examinations without any arrears. I didn’t take any tuition at all, as I was too poor for that. When I was doing PhD, there was a need for me to have a laptop and I had no money for that too. Mercifully, Lucina sister helped me out in that” he recalls with gratitude. Sakthivel is taking part in the free summer coaching camp meant for students from Irular Community and providing them all the inspiration and guidance. His other elder sister has done Nursing Diploma through an Open University. Sakthivel has got a job now as a lecturer in a private college, on a salary of Rs 15,000/-. Cracking competitive examinations like NET and SET, and getting permanent employment in a Government college are what this 29-year-old Irular Tribe student is aiming for next. He is confident of achieving these goals. This topic contains 0 replies, has 1 voice, and was last updated by Pon Dhanasekaran 6 months, 2 weeks ago.